Working with sound is a profession that deals with technical aspects of recording and sound transmission . 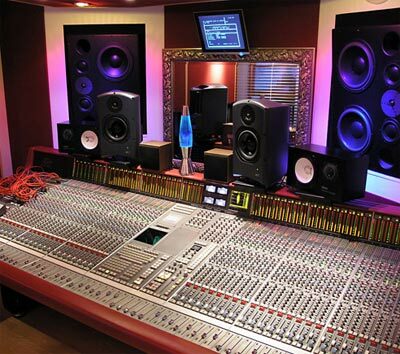 Sound engineers deal with it especially on television, radio and recording studios and film. The purpose of this article is not to provide expert interpretation of this concept and nor fully describe the work of engineer . The effort is to pass some of that experience, to recall some important things and to help young music producers and composers to make a better sound. Mixing in home studio (if you have a professional studio, feel free to skip this step) – If you’re doing music at home or in your home studio , try to mix your track as best as you can . On my site you will find tips and guides on how to achieve a good sound in limited conditions. Mix in a professional studio – Any serious work deserves quality mix. If you are an experienced sound engineer and have a professionally equipped studio, you have the advantage. For others I suggest to give your track to the professional studio. Mastering – It has been already written a lot about the mastering. The base is to realize that even the very best done mastering will not sound good when mastering was done on a poorly mixed track. In the following sections we will talk about everything that affects the sound quality and the possibilities of sound , we look in detail on individual procedures and review some sound effects. What can affect the work of audio engineer? The overall concept – the sound should match the theme of song. For example, if you do the horror theme song, it would be good to mix song in the same style (for example, a lot pulled up of EQ, drastic changes in dynamics and lots of wild effects). Generally, the more obscure songs, the more we use the EQ, a lot of dynamic changes and wild effects. For soft music we use on the contrary the uniform volume, the smooth effects, balanced panorama (stereo). Melody – if the melody is the main element of the song, it is good to use multiple effects (delay, reverb, flanger). If it is a simple melody it is necessary to enrich the melody by effects or the greater panorama. In contrast when melody is complex, we use fewer effects. When the melody is complex, it is again appropriate to increase the volume not to lose individual parts in the background. in this case I would not recommend using of delay or reverb effects (unless it is not conceptual plan). Rhythm – we can use the same basics as for the melody. If the rhythm is complex we use fewer effects and increase the volume. Alternatively, we can increase only some frequencies by EQ. A simple rhythm provides more space for effects. Harmony – adjusting the harmony depends on the type of music and most of the genre. For some genres it will be good to put more dissonance into the background for some quite the opposite. For consonant harmonic components we can use reverb or different “space” effects. Do not be afraid to pay the attention to the dynamics, effects, stereo width, etc. Lyrics – depending what kind of lyrics the song has, you can also add different effects and play with dynamics. Arrangement – again it depends on the overall concept and genre of the song. I can keep arrangements either clean, so that all parts would be understandable (for example by using of EQ), or I can fatten the mix by adding some effects (reverb, flanger). 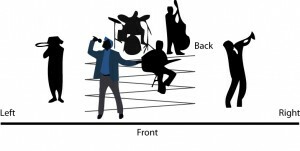 Instrumentation and interpretation – it depends on how you rate the performance of artist or band. Generally, it is suitable to increase the volume and extend the panorama, if we have a good performer. For not so good performances you can use more stereo effects and to put a track more into the background. For totally bad performances, apply effects and turn down the track as much as possible. Structure of songs – for different parts of the song it is good to do some dynamic changes. For example at transient passages you may slightly increase the volume of the drums, use more reverb on the snare, etc. Do not be afraid in different parts of your song to use another reverb and stereo spread, it makes the song more interesting. Quality of recordings – if the quality of the recording is poor you must avoid increasing the high frequencies. Sometime it is even better to reduce them using the EQ. If you mix the song, you should have all 9 points in mind. Feel free to take notes on paper and think about each of them. Before the actual mix, it is good to know what you want to achieve and how the result should look like. If you can not imagine it, you can play some professional track and use it as a reference model. 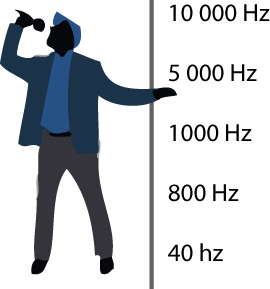 The sound can be characterized by three properties – the position (location of sound source), shape and color, or also by the volume and location in panorama, the height of individual frequencies (EQ) and using different effects. Every sound can be described by its location. Imagine a band on stage. When you listen, you can distinguish each instrument. 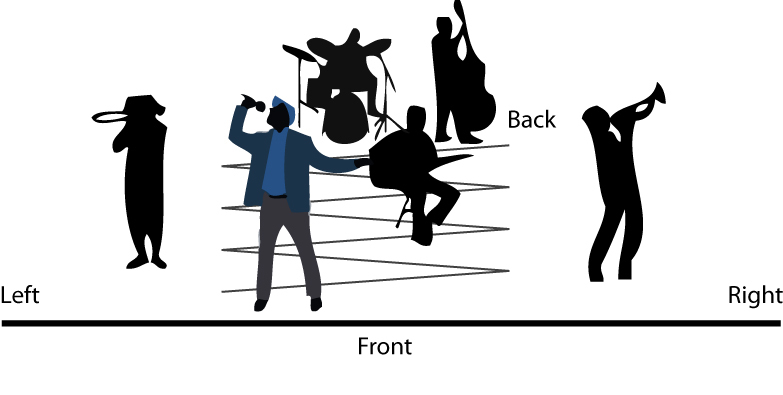 For example, piano plays on the right side, the drummer is back in the middle, trumpet soloist on the other hand in front and at the right side there is a guitarist. The resulting sound is very natural and so pleasant to listen to. Similarly, you can deploy individual sounds when you are working with sound. Display of position is thus not only in the horizontal and vertical plane, but also in the z axis direction. You can use panorama to move the sound to the left or right side. This location is related to the volume of individual sounds. The louder the sound is, the closer it would appear. Apart from the volume there are many ways to give the impression of sounds from distant sources. There are time effects (delay, reverb) to create the impression of a remote sound. While using of much sharp compressor may cause an impression of a nearby sound. Vertical axis – up and down. We can do the location of sound in the vertical plane by adjustment layers of individual frequencies. However, this visual representation is only a perceived impression. Many people hear high frequencies above the lower frequencies. It is not important to examine the reason for it, but there is important to recognize it and try to use it for our needs. It is important to realize that the sound can be placed in 3D space. You can use a variety of tools to achieve this. Placement of a sound barriers is affected by the studio itself – speakers position, floor, ceiling and walls. Therefore, it is good to listen to the recording in more places, such as in your car, at home or in the club. Every sound occupies a space in the mix and thus masks other sounds. The more space a sound takes the more it will overlap with other sounds. To achieve a really readable mix, we need to know how much spaces are taken by the sound. The lower the frequency, the more overlay of sound. Bass tend to occupy much space in the mix and cover other instruments. On the contrary high frequencies occupy very little space. The louder the sound, the more it takes spaces in the mix. If you place the instrument into the panorama, it takes up more space in the mix. If you put for example the left channel of piano a lot to the left and right channel a lot to the right, the resulting effect will be the piano placed across the whole panorama, thus masking other instruments. If one channel is delayed of less than 30ms, the effect arises, which is called fattening. Our hearing is not able to recognize the echo if it is less than 30ms, and the resulting sound is connected together with the original. We can continue to edit fattening by means of effects ( such as EQ). The sound on following figures is indicated by the ellipse. Reverb is a special effect that spreads the sound, to the whole space. Therefore be very carefully by using reverb if you want to have a readable mix. Similarly to fattening you can then apply another effects, and hereby make the correction of its location. Everything can be described using sound characteristics (location, shape and color) and the basic effects such as reverb and stereo spread. All other effects and settings are only a combination of these 3 basic settings. The location of sounds in the mix, their camouflage, stereo spread and reverb show the resulting quality and readability of the recording. The work of sound engineer is to set these values so that each sound was readable and the whole recording would make the compact impression.